This article by Henri de Villiers was first published in 2014 on the blog of the Schola Sainte Cécile, to commemorate the centenary of the start of the Great War. 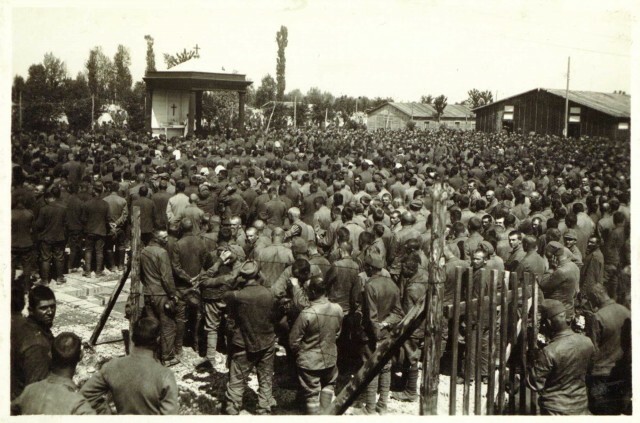 It is translated and republished here and at Canticum Salomonis in honor of Armistice Day, and the centenary of the first armistice, which occurred this past Sunday. On August 3, 1914, Germany declared war on France, and Europe entered into a terrible four years of slaughter that would decimate believers on every side, wiping out the youth of thousands of towns and villages, and bringing about the loss of a great part of Europe’s Christian elite. 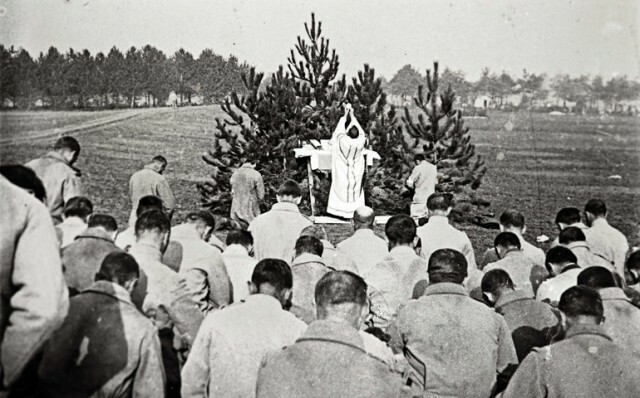 In memory of this sorrowful centenary, we present a collection of photographs that testify to the faith of these men in the midst of the horrors of the front. “For the Lord will judge his people, and will be entreated in favour of his servants.” (Psalm 134,14) – Mass at the front in France during the First World War. “I will love thee, O Lord, my strength. 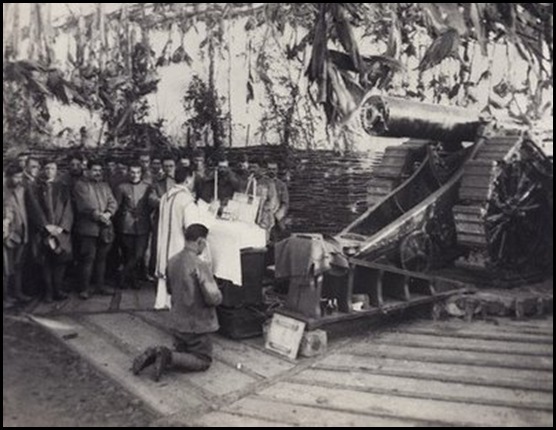 The Lord is my firmament, my refuge, and my deliverer.” (Psalm 17,2-3) – 1915: A Mass at the 43rd battery of the 29th artillery regiment between Oostduinkerke and Nieuport. 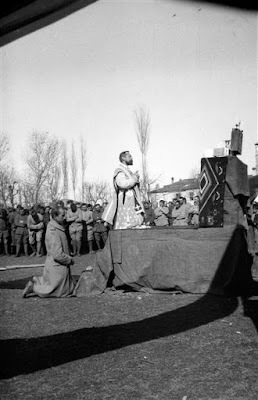 “The Lord will give strength to his people: the Lord will bless his people with peace.” (Psalm 28,10) – 1915: Sub-lieutenant Pape says Holy Mass for the 262nd infantry regiment. Photograph by Henri Terrier (1887† 1918). Musee de l’Armee, Paris. 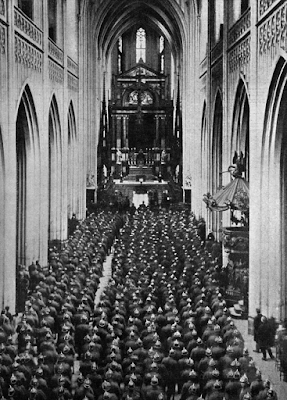 “With thee is my praise in a great church: I will pay my vows in the sight of them that fear him.” (Psalm 21,26) – German troops assist at Mass in the Belgian cathedral of Anvers. 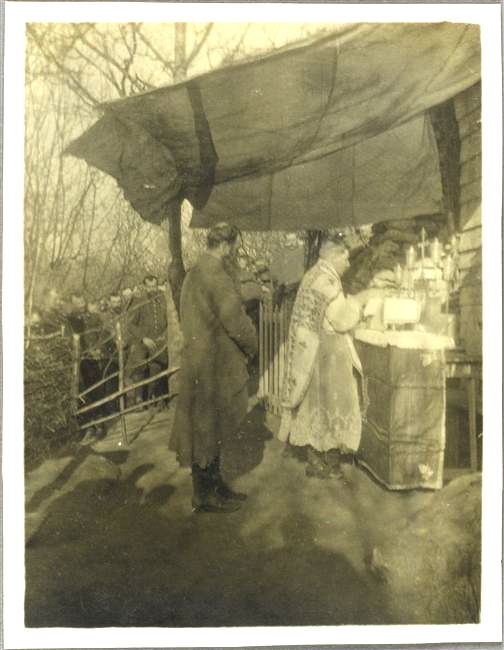 New York Times, March 21, 1915. 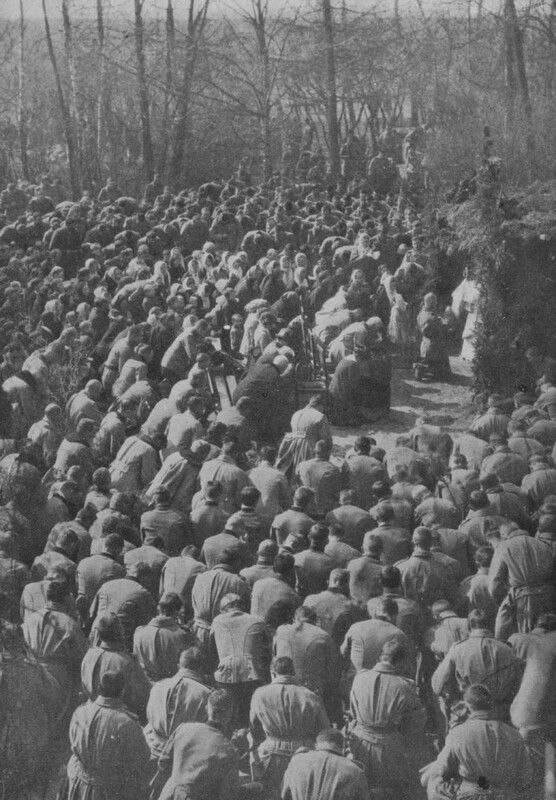 “Salvation is of the Lord: and thy blessing is upon thy people.” (Psalm 3,9) – Austrian soldiers receive Benediction of the Blessed Sacrament in 1915 in Russian Galicia. New York Times, 23 May 1915. “Praising I will call upon the Lord: and I shall be saved from my enemies.” (Psalm 17,4) – A Russian priest celebrates the Divine Liturgy for Russian troops in 1915. The soldiers have formed a choir and are chanting the liturgy next to the altar. The War Illustrated Album DeLuxe, Vol. 1; Amalgamated Press, London, 1915. 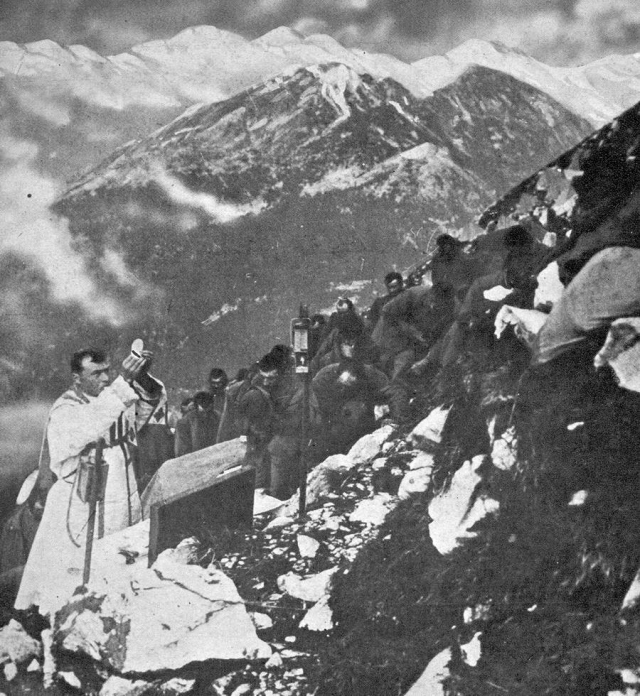 “I have lifted up my eyes to the mountains, from whence help shall come to me.” (Psalm 120,1) – A priest says Mass for Italian troops on the Italo-Austrian front in the mountains of Tyrol. New York Times, February 27, 1916. “And they shall call them, The holy people, the redeemed of the Lord. 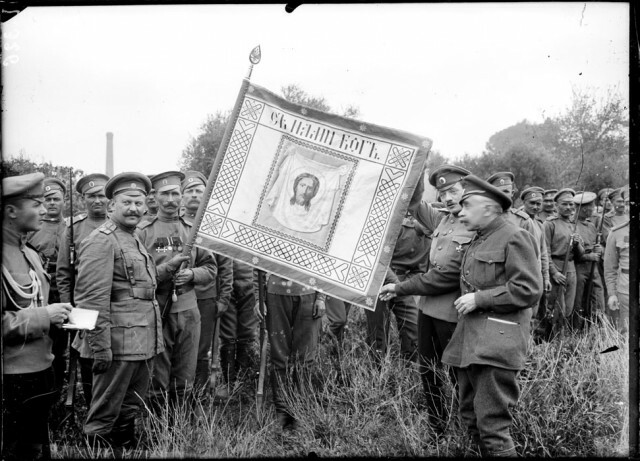 But thou shalt be called: A city sought after, and not forsaken.” (Isaiah 62,12) – April, 1916: Soldiers of the Russian expeditionary corps taking an oath and venerating the icon and cross at the monastery of St Pantaleimon, Mount Athos, Greece. 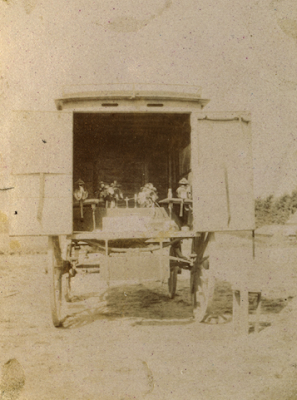 Photograph: Dubray. “God is with us.” (Isaiah 8,10) – April, 1916: In the Mirabeau camp near Marseille, men of the first regiment of the first Russian brigade pose around their flag, decorated with the face of Christ and emblazoned with the motto taken from Isaiah and chanted at Byzantine Great Compline, in particular on Christmas Day: С нами Бог – God is with us. 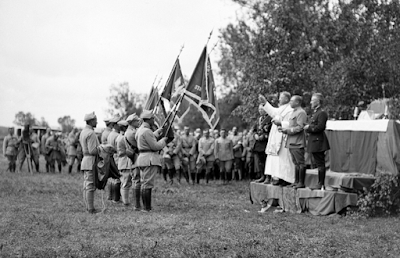 “Behold, God is my saviour, I will deal confidently, and will not fear: O because the Lord is my strength, and my praise, and he is become my salvation.” (Isaiah 12,2) – April, 1916: Gathered on the parade grounds of Camp Mirabeau near Marseille, the men of the first Russian brigade receive the blessing from Fr. Okouneff, chaplain of the regiment, before their departure for the front. “And the Lord is become a refuge for the poor: a helper in due time in tribulation.” (Psalm 9,10) – April, 1916: Gathered on the parade grounds in Camp Mirabeau near Marseille, the troops of the second regiment of the first Russian infantry brigade celebrate Easter, with the Divine Liturgy celebrated by Fr. 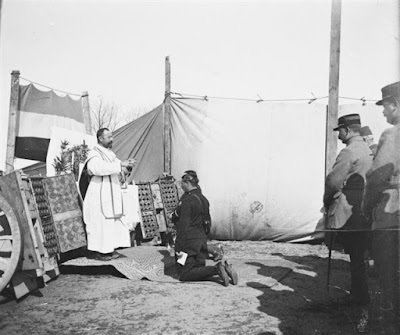 Okouneff, chaplain of the regiment. 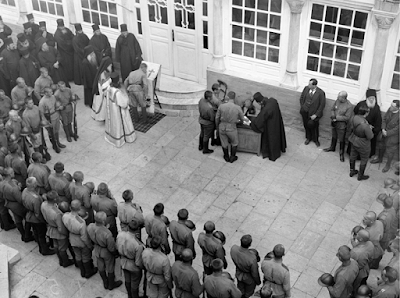 The soldiers have formed a choir and are chanting the liturgy next to the altar. 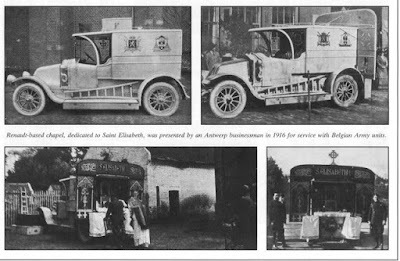 “The sacrifice of praise shall glorify me: and there is the way by which I will shew him the salvation of God.” (Psalm 49,23) – 1916: Renault car-chapel dedicated to St Elizabeth, donated by a businessman from Antwerp to serve the Belgian troops. 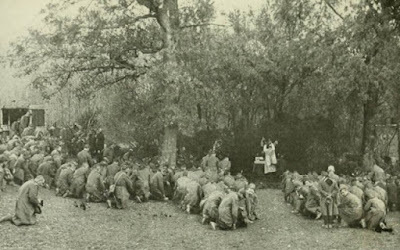 “In that day man shall bow down himself to his Maker, and his eyes shall look to the Holy One of Israel.” (Isaiah 17,7) – French soldiers assist at Mass before going into battle. Source: Vive la France, William Heinemann, Londres, 1916. “Have mercy on me, O Lord, for I am weak: heal me, O Lord, for my bones are troubled.” (Psalm 6,3) – Mass in an Austrian military hospital in 1916. 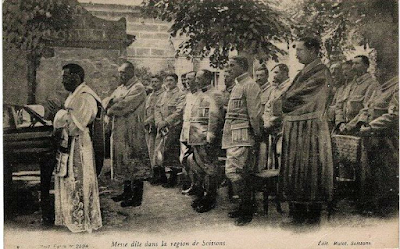 “Thou shalt no more have the sun for thy light by day, neither shall the brightness of the moon enlighten thee: but the Lord shall be unto thee for an everlasting light, and thy God for thy glory.” (Isaiah 60,19) – A priest, probably the famous Fr Paul Doncoeur, S.J., celebrates Mass at an altar – nicknamed the altar of Fr. Doncoeur – carved into the 1st Zouave Quarry, in the quarries of Confrécourt in the Soissonais. Paul Doncoeur was a Jesuit who become a military chaplain in 1914. He participated in the battles of the Marne, Aisne, Champagne, and Verdun, and was seriously wounded at the Somme. 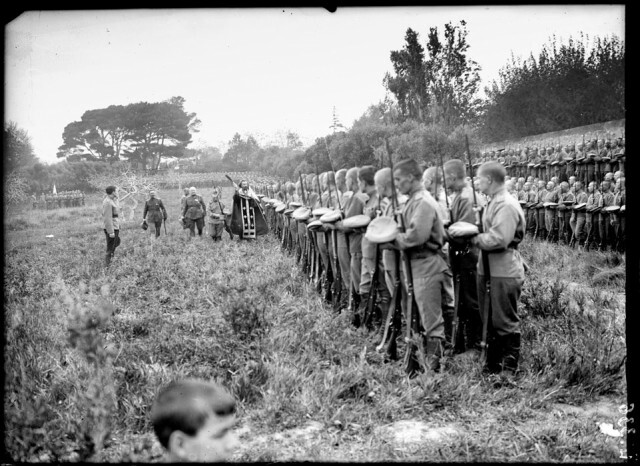 Then he rejoined these regiments for the battles of Reims and Flandres. 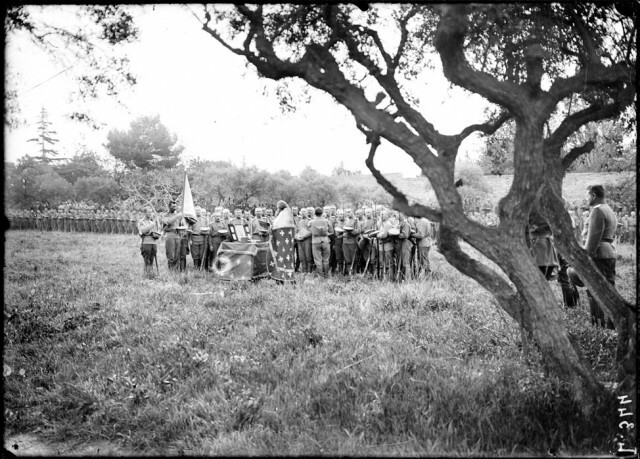 His bravery and dedication to assuring a Christian burial to soldiers who died on the battlefield earned him an immense renown: seven citations, the War Cross, the Legion of Honor. 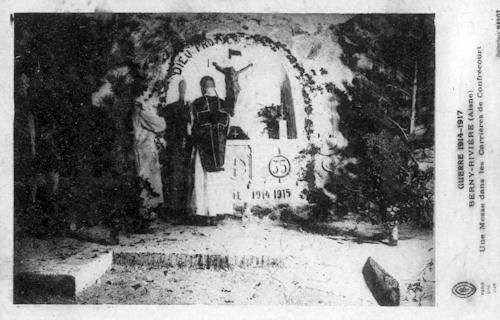 This altar was sculpted by the 35th and 298th infantry regiments in 1914. There is a patriotic inscription written below: “God save France.” On the right, a ladder gave direct access to the front lines. 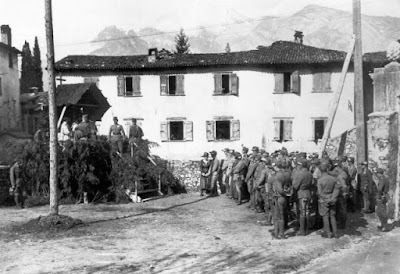 “In my affliction I called upon the Lord, and I cried to my God: And he heard my voice from his holy temple: and my cry before him came into his ears.” (Psalm 17,7) – Mass celebrated for Austrian prisoners of war. 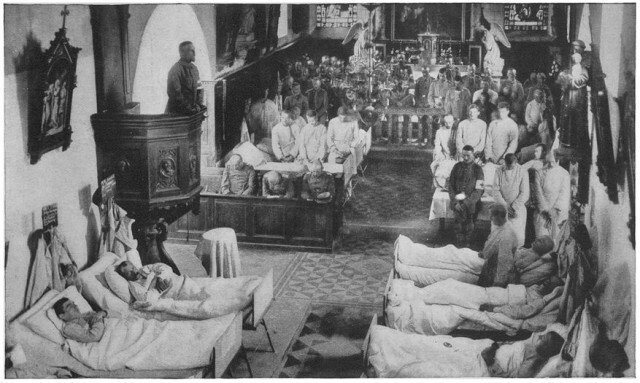 Illustrated War News, Vol. 1, Illustrated London News and Sketch, London, 1916. 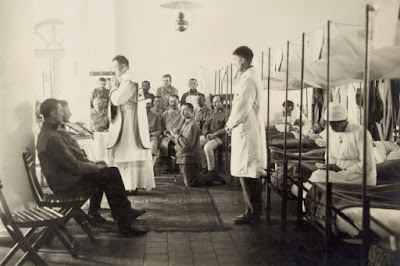 “But I, O Lord, have cried to thee: and in the morning my prayer shall prevent thee.” (Psalm 87,14) – A chaplain preaching in a French church transformed into a hospital. “This hath comforted me in my humiliation: because thy word hath enlivened me.” (Psalm 118,50) – Mass for the troops in the region of Soissons. 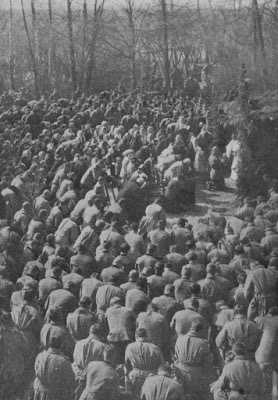 “By this I know, that thou hast had a good will for me: because my enemy shall not rejoice over me.” (Psalm 40,12) – Mass at the front. 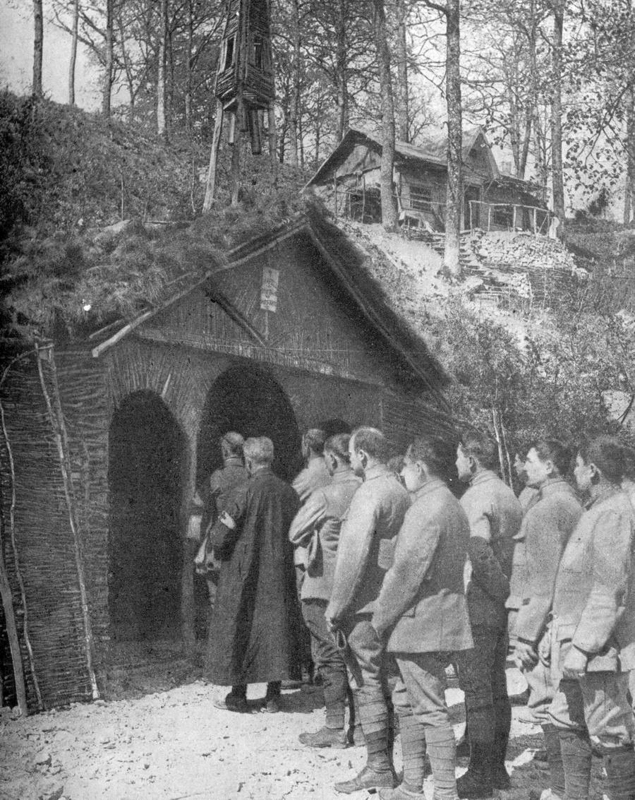 “Offer up the sacrifice of justice, and trust in the Lord: many say, Who sheweth us good things?” (Psalm 4,6) – French soldiers hear Mass in a chapel in the trenches: New York Times, February 25, 1917. “Come and behold ye the works of the Lord: what wonders he hath done upon earth, Making wars to cease even to the end of the earth. He shall destroy the bow, and break the weapons: and the shield he shall burn in the fire.” (Psalm 45,9) – March 1917: M. l’Abbé Louis Lenoir (1882-1917), military chaplain to the 4th colonial infantry regiment, celebrating Holy Mass for the troops at Gravena (Greek Macedonia), shortly before his death in May 1917. “Turn away from evil and do good: seek after peace and pursue it.” (Psalm 33,15). – Mass on the Italian front in 1917. 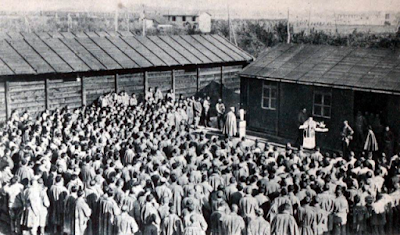 “Bring my soul out of prison, that I may praise thy name: the just wait for me, until thou reward me.” (Psalm 141,8) – Austro-Hungarian prisoners of war assist at Holy Mass in a prisoner-of-war camp in Italy in 1917. British Library. “Be thou mindful of thy word to thy servant, in which thou hast given me hope.” (Psalm 118,49). 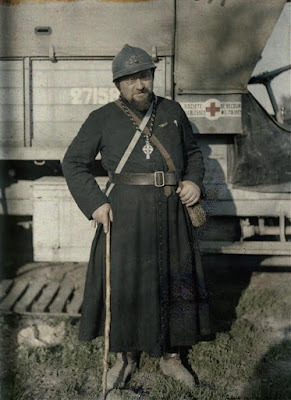 – Abbé Even, chaplain of the 51st division. Photograph taken 10 September 1917 by Paul Castelnau (1880 † 1944). Médiathèque de l’Architecture et du Patrimoine, Paris. 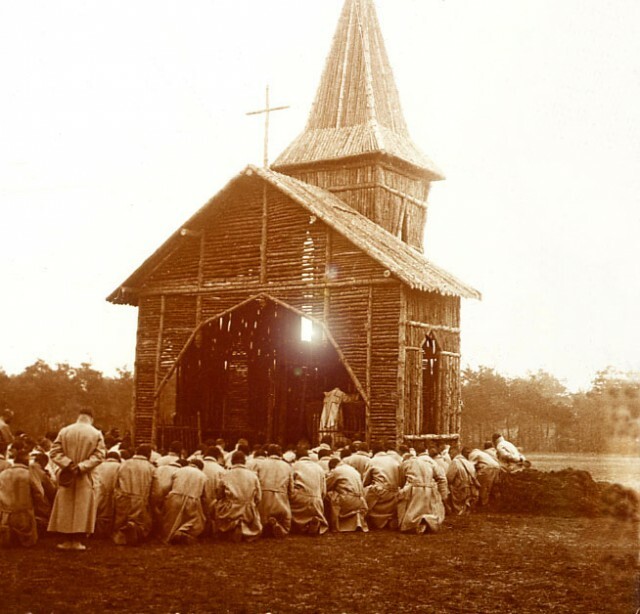 “All the flocks of Cedar shall be gathered together unto thee, the rams of Nabaioth shall minister to thee: they shall be offered upon my acceptable altar, and I will glorify the house of my majesty.” (Isaiah 60,7) – Field altar for Mass in the open air, installed in the back of a car in 1917. Photograph: Georges Pila. “All ye inhabitants of the world, who dwell on the earth, when the sign shall be lifted up on the mountains, you shall see, and you shall hear the sound of the trumpet.” (Isaiah 18,3). 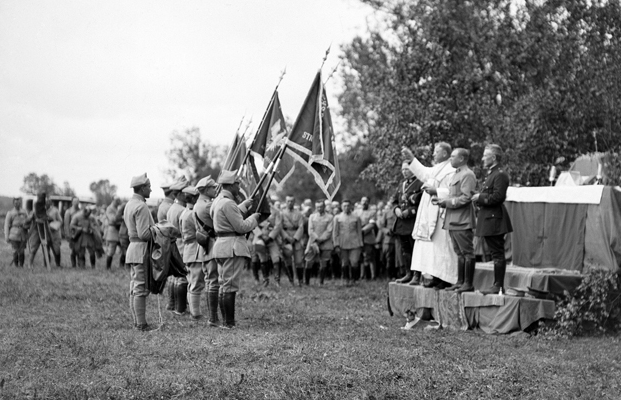 – June 22, 1918, blessing of Polish flags in the woods of Beaulieu, Aube. 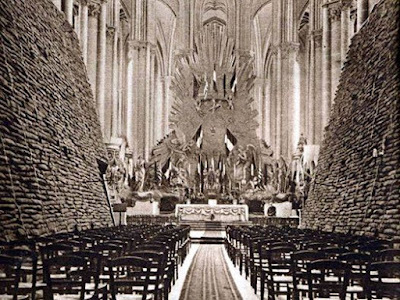 Photograph: Auguste Goulden. 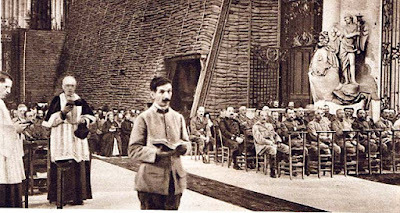 “You shall have a song as in the night of the sanctified solemnity, and joy of heart, as when one goeth with a pipe, to come into the mountain of the Lord, to the Mighty One of Israel.” (Isaiah 30,29) – 1918: Mass celebrated in Amiens Cathedral, where the walls have been reinforced with sandbags to protect them from bombardments. “In the year that king Ozias died, I saw the Lord sitting upon a throne high and elevated: and his train filled the temple.” (Isaiah 6,1) – Interior of Amiens cathedral, with sandbags to reinforce the building against shelling, 1918.